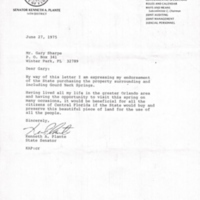 A letter from Senator Kenneth A. Plante (1939-2015) to Gary I. Sharp, dated June 27, 1975. 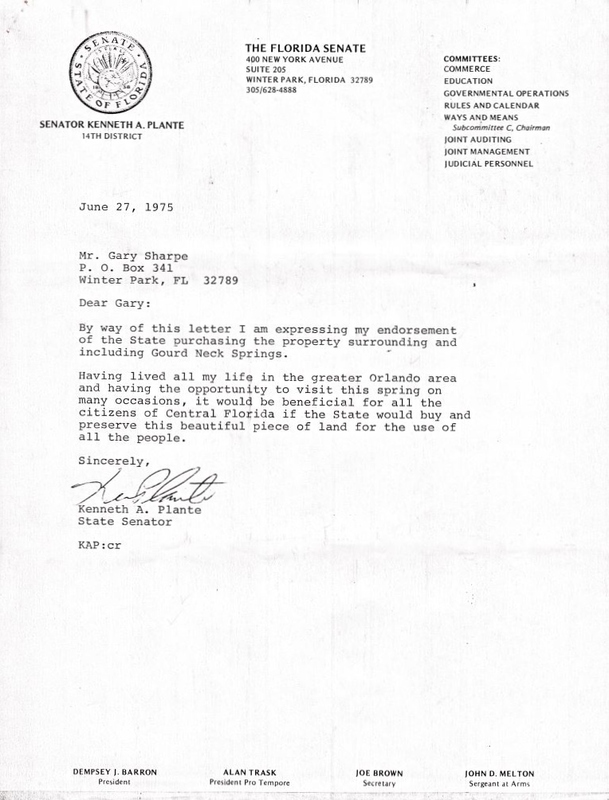 In this letter, Sen. Plante states that he endorses a potential purchase by the State of Florida of the Gourd Neck Springs area for use as a potential recreational park. Gourd Neck Springs is a small spring located in the southwest portion of Lake Apopka, in a small cove called “Gourd Neck” due to its distinctive shape. This area of the lake was considered in the 1960s as a potential nursery for fish. The Lake Apopka Technical Committee explored damming the Gourd Neck, separating it from the lake and preventing polluted lake water from entering, but these plans did not materialize. Efforts were also made in the 1960s to have the Gourd Neck area purchased by the State of Florida for use as a public park. The Gourd Neck Springs Park Association was formed in 1961 to study the site’s potential for a park and lobby for support from legislators. The land bordering the area was privately-owned by various individuals. One of these, Gary I. Sharp, continued seeking support for a park into the 1970s. While the project received support from Florida legislators and environmentalists, the land was never purchased by the state. Photocopy of original 1-page typewritten letter from Kenneth A. Plante to Gary I. Sharp, June 27, 1975: binder 1975, Friends of Lake Apopka Archives, Ginn Museum, Oakland Nature Preserve, Oakland, Florida. Digital reproduction of photocopied 1-page typewritten letter from Kenneth A. Plante to Gary I. Sharp, June 27, 1975. Binder 1975, Friends of Lake Apopka Archives, Ginn Museum, Oakland Nature Preserve, Oakland, Florida. Friends of Lake Apopka Collection, RICHES of Central Florida. Originally created by Kenneth A. Plante. Copyright to this resource is held by the Friends of Lake Apopka and is provided here by RICHES of Central Florida for educational purposes only. "Apopka Spring." Lake County Water Atlas. Accessed June 08, 2016. http://www.lake.wateratlas.usf.edu/resource.aspx?wbodyid=8500. Campbell, Ramsey. "Source of Surprise: Crystal Clear Water from Lake Apopka." The Orlando Sentinel, April 23, 1995. Accessed June 8, 2016. http://articles.orlandosentinel.com/1995-04-23/news/9504220188_1_lake-apopka-spring-water-bottled-water. "Letter from Arthur W. Sinclair to C. W. Sheffield (December 22, 1967)." RICHES of Central Florida. https://richesmi.cah.ucf.edu/omeka/items/show/6858. Plante, Kenneth A.. “Letter from Kenneth A. Plante to Gary I. Sharp (June 27, 1975).” RICHES of Central Florida accessed April 20, 2019, https://richesmi.cah.ucf.edu/omeka/items/show/7832.